The Regnum Francorum Online (RFO) historical GIS does not exclusively concern the Merovingian and Carolingian Frankish kingdom, but also the Roman foundation on which the Early Medieval civilisations was built. To put some light on this, and describe the Late Roman empire, two layers are part of the GIS. Both layers are based on primary sources. The first layer is a compilation of Roman itineraries (e.g. Peutinger map, Itinerarium Antonini), description of the administrative and political order of the Late Roman empire (e.g. Notitia dignitatum), narrative sources and Roman places mentioned on the milestones. All together, there are 2190 evidence of place, distributed among 799 Roman places. The second layer contains all the milestones themselfes and their place of discovery. The milestone layer has 1039 entries distributed among 613 places of discovery. The layers cover the western half of the Roman empire north of the Alps and the Pyrenees, and extend into the Roman province Pannonia, modern Hungary. The latter layer is motivated by the importance of the Roman roads network, which is part of the background maps for the entire GIS. All the sources are listed at the end of this post, together with their availability in online digital libraries. 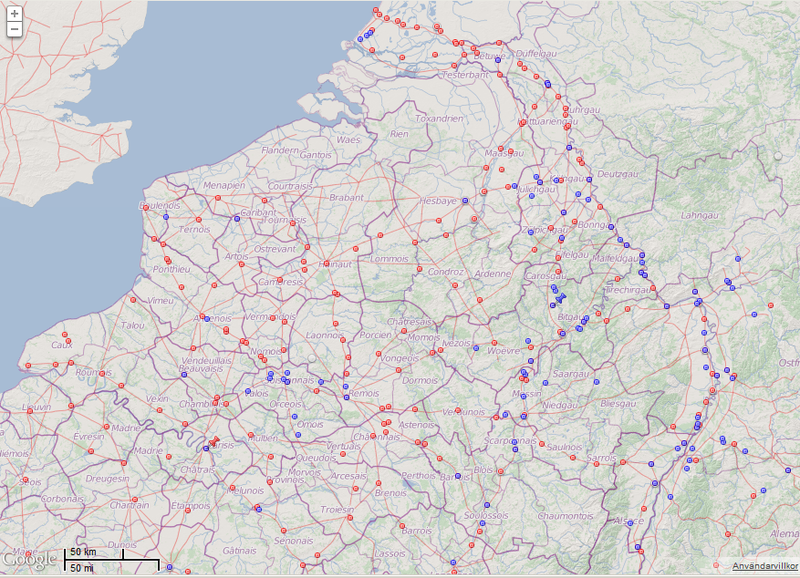 Figure 1: Places in Late Roman sources (red) and place of discovery of Roman milestones (blue) between the river Seine and Rhine, zoom level 7. These sources have been georeferenced so when rendered on the map and receiving input by a mouse click, the source entries for the selected place will be listed in the output pane to the right. In the output pane a list of source entries for the selected place is displyed together with a citation from the source and links to digitized source editions. If the source edition is available on Google Books or the Internet Archive, you have the option to view the source inside the RFO application. Sources hosted in the Perseus digital library can also be viewed inside RFO, because they are available as XML-documents. The Peutinger database is serving small images of the map centered on the selected place, together with the transcription as part of the XML-output, see figure 2 below. The places currently on the visible part of the map can be listed by selecting the Places menu tab. Not all sources are fully complete (especially Ammianus Marcellinus and Ptolemy), but a vast majority of the places mentioned in the other sources should be in the database. As far as I know the milestones are fully complete within the area selected. 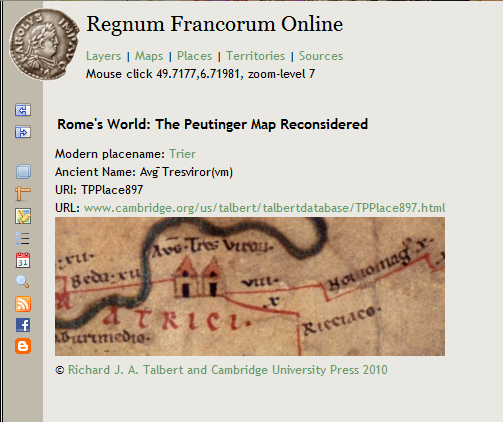 Figure 2: The entry of Augusta Treverorum (Trier, Rheinland-Pfalz, Germany) on the Peutinger map embedded into the RFO application. Both layers are listed in the Layers menu tab, in the section Layers based on primary sources : Thematic layers, in the RFO application. They can be loaded following the links below. In this post I will demonstrate what can be achieved regarding knowledge of Ancient history by compiling persistant identifiers of several external resources. The coordination of sources, and hence the advantage of having them displayed together, is accomplished through the use of a common geographical interface, where layers of one or more external sources could be displayed. 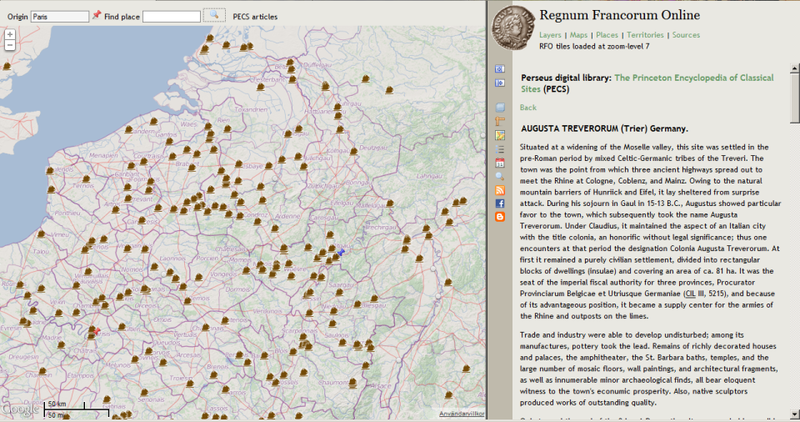 The Regnum Francorum user interface showing georeferenced articles of the Princeton Encyclopedia of Ancient Sites, with the embeded article of Augusta Treverorum (Trier) in the right pane. The Regnum Francorum Online (RFO) historical GIS has recently been updated with a new user interface, built on Google Maps API 3.x. The GIS uses its own base tiles for zoom levels 6-10, made by the Mapnik software. These tiles are based on geographical data from OpenStreetMap (OSM) and the SRTM elevation data from NASA. It also contains basic historic information of the Late Roman civitates and early bishoprics of Western Europe, established until the 9th century, borders of the Early medieval counties (pagi) and the Roman roads network. 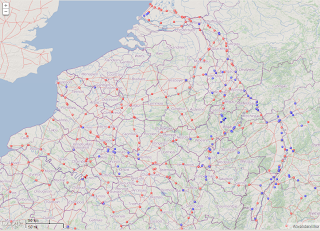 Further geographical details can be viewed through the use of a collateral secondary map, covering zoom levels above 10, that is, embedded maps from OpenStreetMap (OSM), Google Maps (streetmap, terrain and satellite), the 18th century Cassini map of France, and an experimental topographical map covering the Moselle and Rhine regions of France and Germany, combining data from OSM and SRTM. The aim of the historical GIS is to compile evidence of places, institutions and territories from both primary and secondary sources, and render them as layers on top of the basemap. If the source editions are available online, the GIS will provide links to, or embed these sources into the historical GIS. Recently, I have introduced tags of identifiers from certain external sources, that contribute to the definition of a place. These tags refer to entries in online encyclopedias (Wikipedia and the Princeton Encyclopedia of Classical Sites), topographical dictionaries (Toponymisch woordenboek) and gazetteers (Pleiades ancient places), as well as information from other geographical systems such as OpenstreetMap, Cartes IGN (France), and Google Satellite images. The tags regarding the latter, refer to manually selected archaeological features, whether or not archaeological remains are visible on satellite images (Google), or defined on the maps from IGN and OSM. In the case of Google and IGN, links are provided to embedded versions of these maps within RFO; in the case of OSM, an external link to the geometry entry at the OSM geographical database is displayed. Selected Wikipedia articles in English, French, German and Dutch with historical or archaeological content. Currently, 867 places have one or more Wikipedia article. Typically, the Wikipedia articles selected here refer to an ancient place known by name, or a major archaeological site. Load this layer by clicking this link. Selected OSM geometries (point or polygon). Currently 450 places have one or more OSM geometry. Archaeological sites and remains are typically described by a point or a polygon outlining the site or ruin. Load this layer by clicking this link. Archaeological remains visible on Google satellite images. Currently there are almost 200 sites in the database. The quality of the images vary. Clicking the provided link in the result pane will embed the Google satellite map at zoom level 16. Load this layer by clicking this link. Archaeological remains defined on the Cartes IGN (France). Currently there are 107 sites in the database. 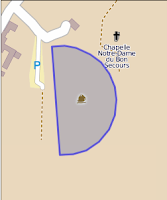 Clicking the provided link in the result pane will open the topographic map of France in a new tab or window. Load this layer by clicking this link. This layer contains all the articles of the Princeton Encyclopedia of Classical Sites (PECS) concerning ancient places and archaeological sites in modern Austria, Belgium, France, Germany, Hungary, Luxembourg, Netherlands, Switzerland, and a couple of places elsewhere, in all over 700 places. The Perseus digital library that hosts the encyclopedia outputs articles and source texts in both XML and HTML. This makes it possible to embed the article inside the RFO application, which is of course very convenient. Load this layer by clicking this link. This layer contains links to a growing number of entries in the topographical dictionary of Belgium, Netherlands, Luxembourg and adjacent provinces in France and Germany. I have selected places with evidence in sources no later than A.D. 950. The dictionary also contains places that are mentioned later during the Middle ages. This electronic resource from the University of Antwerpen is based on the Toponymisch woordenboek von België, Nederland, Luxemburg, Frankrijk en West-Duitsland (vóór 1226) by Maurits Gysseling, published in 1960. This particular area is of vital importance for the rise to power of the Arnulfing-Carolingian family in the the late 7th century. There are also many written evidence in Late-Roman sources for places in the provinces of Germania and Belgica covered by this dictionary – Trier, Augusta Treverorum, was once the capital of the Roman empire. So far, there are almost 550 places in the database with a link to the topographic dictionary. Load this layer by clicking this link. Below is the outcome of a click on a place called Heidetränk, located in Oberursel (Taunus) in Hesse, Germany, where there are extensive remains of a large Celtic oppidum. The image to the left is from the collateral map of the Moselle-Rhine region at zoom level 14. 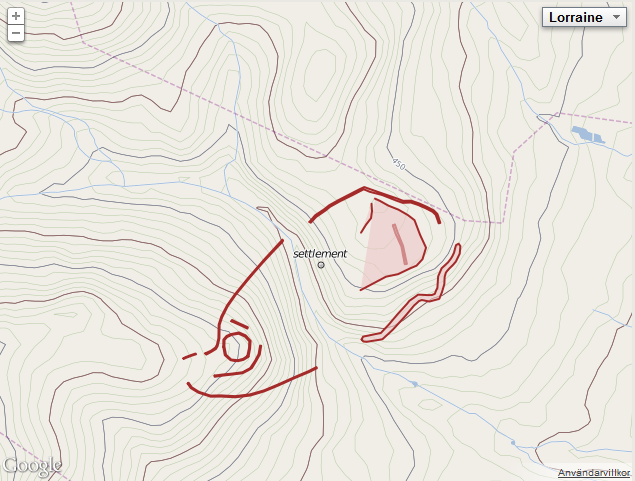 Normally, the archaeological sites in OSM display at zoom level 16 and above, but since this experimental map is intented to serve as a historial / archaeological basemap, their apperance is defined differently. The Heidetränk oppidum is defined in OSM by a series of polygons. Below are links to their entries in the OSM database. There are also links to articles in the German Wikipedia and the website Oppida : the first town north of the Alps, and a link to the Heidetränk entry in Pleiades Ancient Places gazetteer. 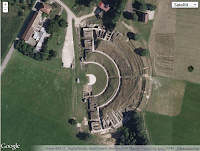 Below is the outcome of a click on a place called Mandeure, département Doubs, France, once a roman vicus, a small town with the remains of a theater. The image to the left is from the collateral Google satellite map at zoom level 18. The outline of the theater is defined in OSM by a polygon. There is also a link to an article in the Princeton encyclopedia of classical sites, which can be embedded in RFO, links to two articles in the French Wikipédia, a link to the Pleiades gazetteer, and finally a link to the embedded Google satellite image indicated by the satellite=yes link (this link is deactivated here). Following the link to OpenStreetMap where the polygon of the theater is defined, will display the following image, which is made up by 15 pair of coordinates.